Today we look down on a busy street. Can you find the bus and name the location? Extra credit if you can name the business that was once housed in the building on the right. THE ANSWERS ARE IN! We don’t know exactly when this photo was taken, but this if Forsyth Boulevard and Famous Barr was in that building on the right. The Pevely Dairy and Fountain are across the street. Bingo! 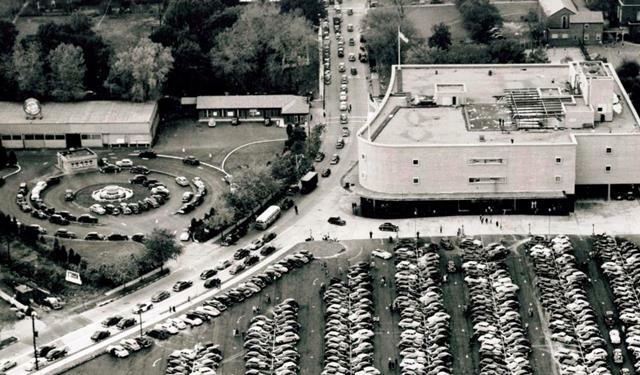 That was a Famous Barr, and this is an aerial view of Forsyth Boulevard. You’re exactly right, Don – good job! That Famous Barr was opened in 1948. Across Forsyth Blvd., on the left, is the Pevely Fountain which was removed, I believe, in the late ’50s.